Oblique LC90 box base legal size hanging file compartments with hooks are an economical choice for storing legal case files and records. The Oblique LC90 box base folders hang from steel rods and will hold 3.56″ of legal size documents or file folders. The 3.56″ Box Base LC90 legal folders are perfect for storing multiple files in the same hanging compartment. LC90 folders come in a choice of gray or orange with optional environmental green-friendly material. The Oblique LC90 box base legal size file folders are constructed from 220 gram kraft manila with steel hooks, and include an unprecedented 10 Year Warranty. Each Oblique LC90 hanging folder compartment comes with a 6 inch label holder with a pivoting magnified lens to make reading file names easy. The name labels come in six (optional) colors and will accept fonts up to 24 point to help files to be recognized file from a distance. 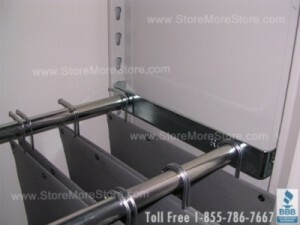 StoreMoreStore’s Oblique LC90 legal size box base hanging file folders are priced to be the lowest price on the internet. Visit StoreMoreStore today where you will find the LC90 and all of the Oblique legal size filing products like the LC V-Base file compartments, LCL Long V-Base file folder compartments, LC30 box base compartments, LC50 box base compartments, and LC80 box base compartments. You will also find the complete line of the legal depth Oblique Unifile file compartments (UFLG, UFLGL, UFLG30, UFLG50, and UFLG80) as well. Visit StoreMoreStore today to shop for the best prices on Oblique LC90 box base file folders!